Flanked by one of her attorneys, Angela Wagner prepares to leave a Pike County court Wednesday. The second pretrial of Angela Wagner, one of four members of the Wagner clan charged directly with causing the deaths of eight persons, including seven members of the Rhoden family in 2016, was slated to start at 1:30 p.m., Wednesday. At about 3:05 p.m., a bailiff in the Pike County Court of Common Pleas asked all those in the courtroom to rise, announcing the arrival of Judge Randy Deering. Deering sat on the judge’s bench and quickly began the proceedings, announcing what was taking place that day was a pretrial in the case of Angela Wagner. Deering then looked up from his desk and noticed one important person was missing from the courtroom, namely the defendant. One of Wagner’s attorneys returned to the area behind the courtroom where prisoners are held prior to trials. He and his sheriff’s deputy reappeared with Wagner, dressed in a striped jail shirt. No explanation for her initial absence from the pretrial ever was given. Once Wagner was seated, the pretrial lasted all of roughly five minutes. Deering stated with the agreement of counsel on both sides, many of the 49 pretrial motions filed by defense attorneys would be dealt with at a later date. Deering stated both the prosecution and the defense needed more time to deal with all of the evidence and discovery connected with the complicated, death penalty case. Discovery is essentially counsel’s request for evidence and materials related to the matter at hand. “The court is permitting (this) because it is important that we be ready to hear these motions,” Deering said. Deering said the defense has until Sept. 1 to file any of what he called substantive pretrial motions. Prosecutors will then have until Sept. 16 to respond to those motions. At the same time, Deering set a pretrial hearing on all substantive issues for 1:30 p.m. Sept. 16. He also set another pretrial, presumably dealing with non-substantive issues, for May 16. In this context, “substantive” refers to motions dealing with the substance of the case, namely evidentiary issues and similar questions. Notably, those substantive issues do not include Wagner’s request for a change in venue filed in December. Court observers seem to feel that issue will not be taken up until much closer to whatever trial date finally emerges. The state’s initial response to the change of venue request was filed with Deering March 7. Some examples of substantive motions already filed by the defendants might or might not include such items as the defendant’s motion to compel disclosure of aggravating factors and information relating to mitigating factors, a motion to compel law enforcement officials to turn over and advise the prosecuting attorney of all information acquired during the course of the investigation or a motion for disclosure of the juvenile records of plaintiff’s witnesses. Deering did not specifically discuss what issues he considered substantive. Neither prosecutors nor the defense team were able to discuss the question of what motions might be considered substantive as Deering has imposed a gag order mandating no one connected with the case speak with the media. As have the defense teams of the other murder suspects in the Rhoden case, Wagner’s attorneys have filed a motion to have her appear in court in civilian clothes. Judging from the fact she appeared Wednesday in jail garb, Deering has yet to rule on that motion. Some court observers claimed Wagner was wearing a bulletproof vest beneath her jail jumper in court Wednesday. Again, as court personnel are under the same gag order as attorneys connected with the case, the presence of a bulletproof vest could not be confirmed. The next pretrial scheduled in the Rhoden case is set for Friday. The son of Angela Wagner, George Wagner IV is set to be in front of Deering at 1:30 p.m. that day. 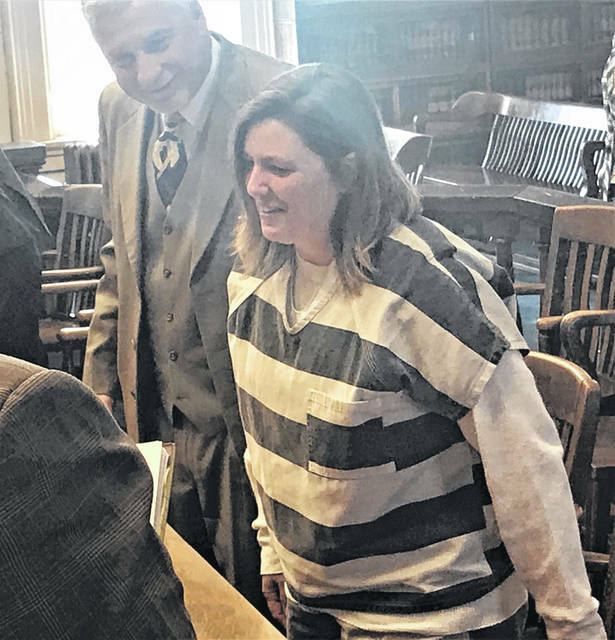 https://www.portsmouth-dailytimes.com/wp-content/uploads/sites/28/2019/03/web1_a-wagner-2.jpgFlanked by one of her attorneys, Angela Wagner prepares to leave a Pike County court Wednesday.